Detroiters have heard before that the Motor City could see better mass transit as soon as 2015. Local and state leaders came together in 2012 to form the area’s first regional transit agency (RTA), but Streetsblog reported locals are losing patience with Michigan’s newest RTA. While waiting times for buses drag on, frustration grows. The RTA recommended holding off on a ballot measure for another two years, prompting a protest march from transit advocates. They marched from the Rosa Parks Transit Center to the board’s meeting place at 1001 Woodward, one of many Rock Ventures developments in the region (Read a Q&A with Rock Ventures real estate chief Jim Ketai here). RTA’s chief executive John Hertel resigned in January in part because of concerns about funding stability—a problem that still plagues transit efforts in a region with a long history of sprawl, segregation, and steep financial challenges. Detroit’s light rail project, the Woodward Light Rail Line, got a boost last year from former U.S. Transportation Secretary Ray LaHood in the form of $25 million in federal TIGER funding. 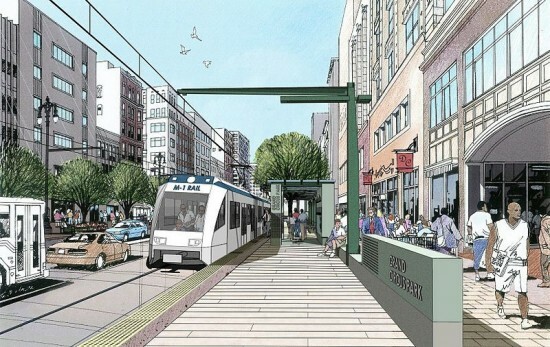 The 3-mile long light rail system along Woodward Avenue would include 11 stops running from the city’s downtown to New Center.